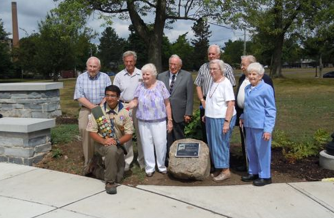 A new memorial garden was dedicated at 11:00 AM Friday July 27th at the Veterans Memorial in Amherst State Park. 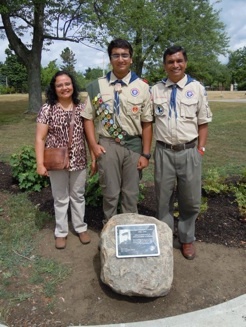 The Garden was an Eagle Scout project by Kiran Prasad. 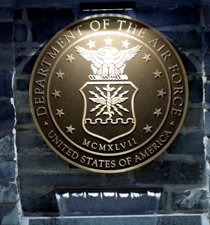 It is being dedicated in memory of Pvt. 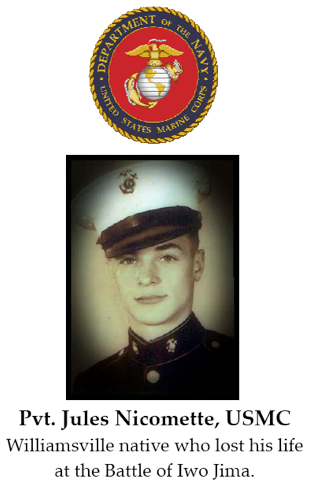 Jules Nicomette, The former Williamsville resident, 19, was killed on February 22, 1945, in the Battle of Iwo Jima during World War II. 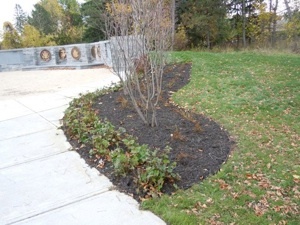 After contacting Marlette to initiate the project, Prasad then spoke with Sherman, who recommended the garden honor Nicomette. 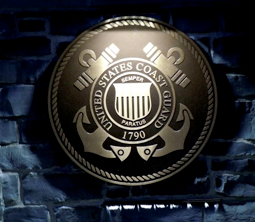 Sherman said he told Prasad that unlike some military personnel during World War II, Nicomette’s body was returned to American soil and was buried at SS. Peter and Paul Cemetery on South Union Road. Sherman also said four members of Nicomette’s regiment made history by being photographed attempting to erect an American flag at Iwo Jima. “We will never know what might have happened if Nicomette had survived that assault,” Sherman said. 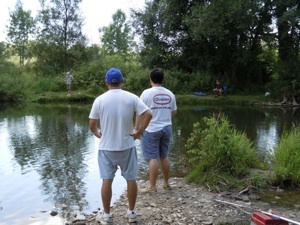 Prasad then knew he had found the person he wanted to honor. 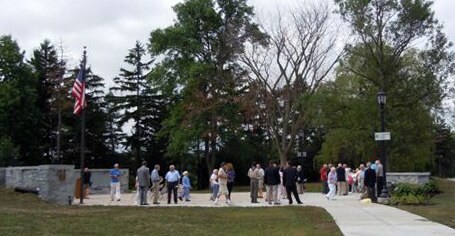 “This memorial represents all the people who go to war and don’t come back,” he said. 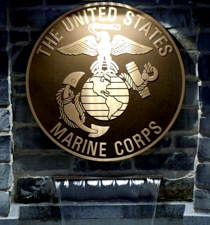 To create the plaque on the rock, Prasad was assisted by Steel Crazy Iron Art, which was an experience he said he won’t forget. 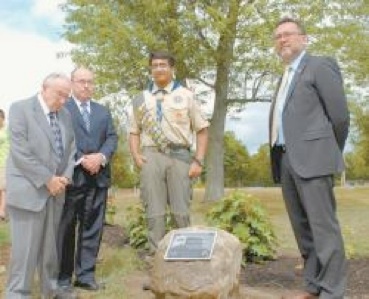 He said the rock was then donated by Lafarge, a supplier of concrete materials. 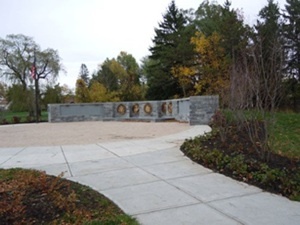 Once the garden and memorial to honor Nicomette were complete, Marlette and the town scheduled a ceremony to dedicate the new facets of the Veterans Memorial. 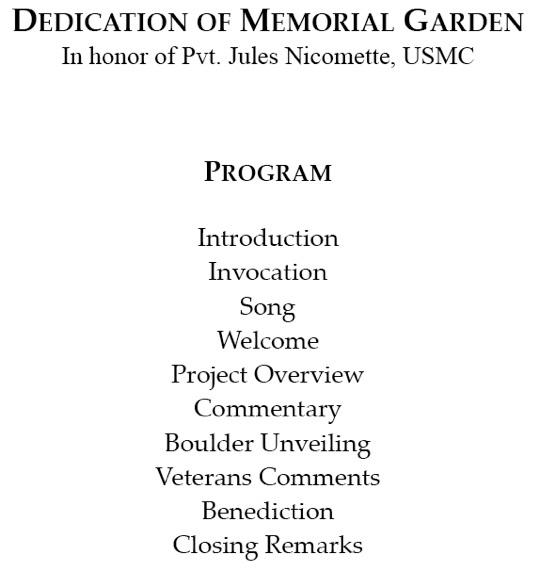 The dedication, held Friday, featured appearances by eight of Nicomette’s classmates from Bishop Neumann High School class of 1944, including George Klein, who served as a pallbearer during the Marine’s funeral. 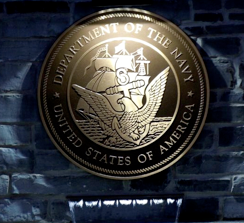 Klein, who served in the Naval Air Corps during the war, said Nicomette, or “Nicky” as he was known to classmates, was a member of the basketball and baseball teams and was a friend to many people. 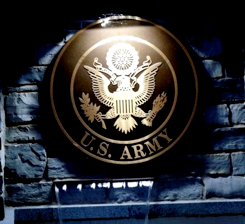 Prasad said he hopes his project will better inform the public of how important it is to recognize veterans — as well as those who, like Nicomette, died for their country. 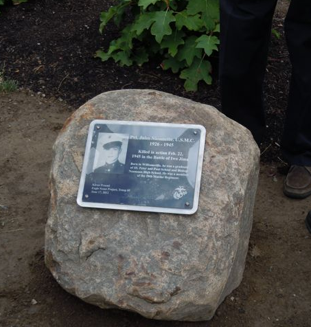 A dedication ceremony was held Friday in honor of Pvt. 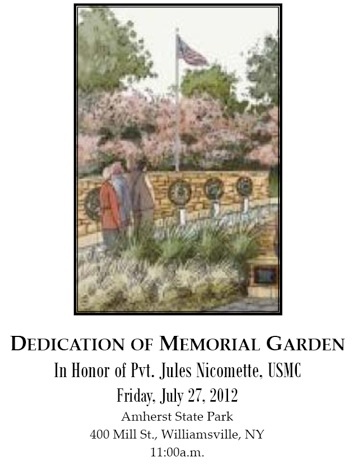 Jules Nicomette, a Marine who died in the Battle of Iwo Jima. 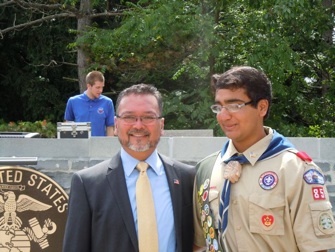 From left are Nicomette’s classmate, George Klein; Town Historian David Sherman; Eagle Scout Kiran Prasad; and Deputy Supervisor Guy Marlette. 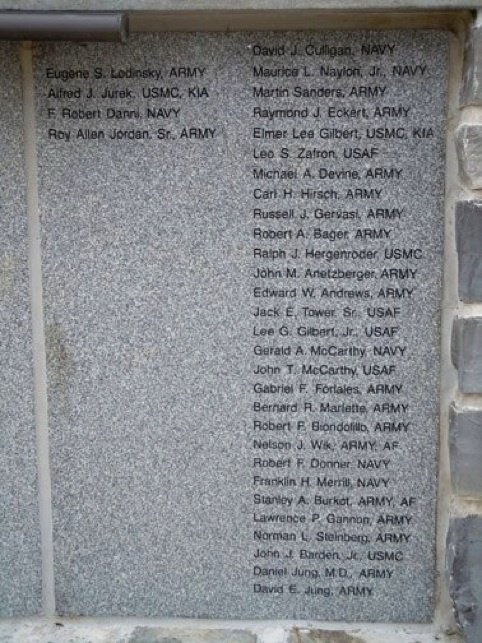 Kiran Prasad had always wanted to create a project that would honor a fallen member of the nation’s armed services. 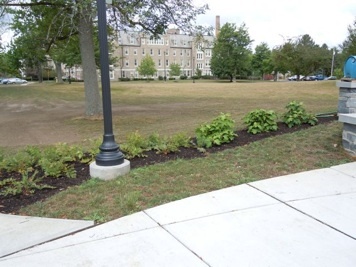 Following several months of planning and coordinating his efforts with the Town of Amherst, the 16-year-old incoming junior at Williamsville East High School saw his ideas come to fruition last week. 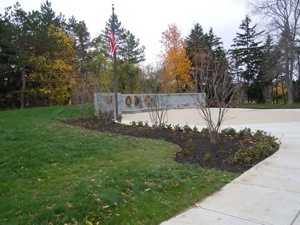 A Memorial Garden was created in honor of Pvt. 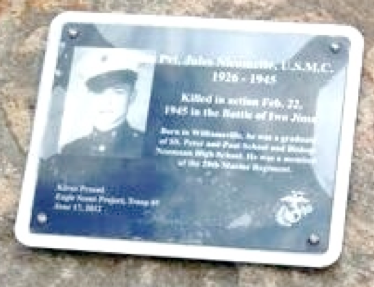 Jules Nicomette, a Williamsville resident and member of the U.S. Marine Corps who died in February 1945 during the World War II Battle of Iwo Jima. 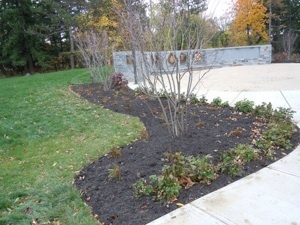 The garden is located near the Veterans Memorial at Amherst State Park, 400 Mill St. near Sheridan Drive. 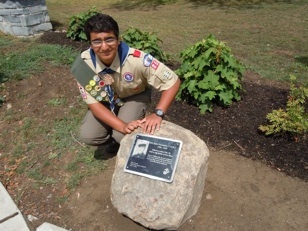 Prasad chose to create the garden and honor Nicomette — who died at age 19 — as his Eagle Scout project for Troop 85. 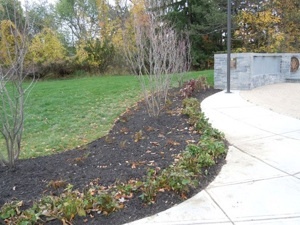 Working with Deputy Supervisor Guy Marlette, Town Historian David Sherman and Town Senior Landscape Architect Bob Walters, Prasad’s project began to take shape. 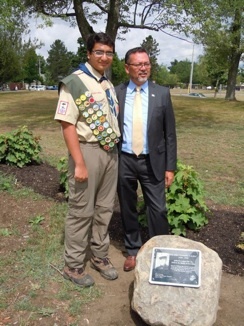 Prasad worked to design a plaque that includes a brief biography and photograph of Nicomette set onto a large rock to serve as a monument in the garden. 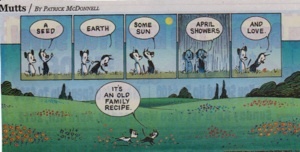 “I was amazed at how quickly it came together,” he said. 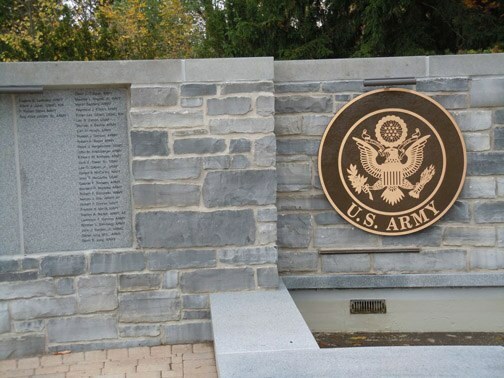 The first group of about 33 names of Amherst veterans has been engraved on the granite panel to the left of the ARMY medallion. 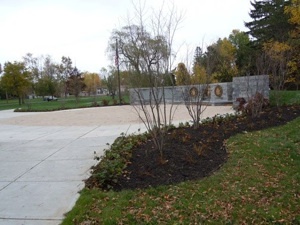 If you are interested in having a loved one's name placed on the wall, purchasing a memory tree or bench, becoming a sponsor or making a donation for the memorial, please contact the Town of Amherst Supervisor's office at 631-7032.